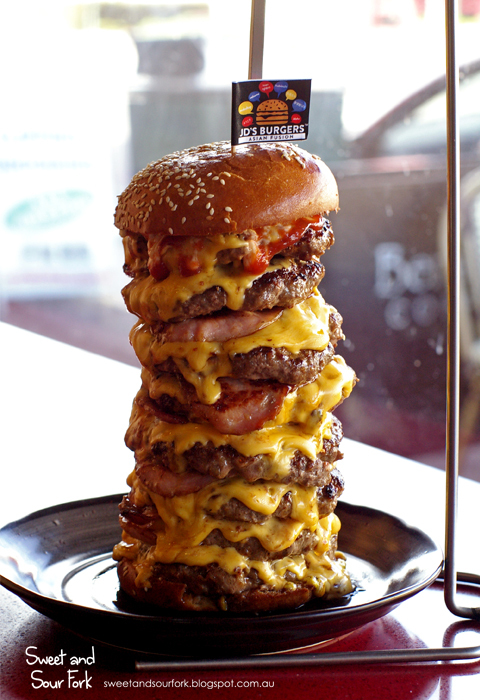 What does an 8-layer burger look like? This. It looks like this. It looks like regrets and dreams stacked into a 2kg monstrosity of cholesterol and saturated fats. Thankfully I wasn’t the one who ordered this. This guy was the one who ordered it. 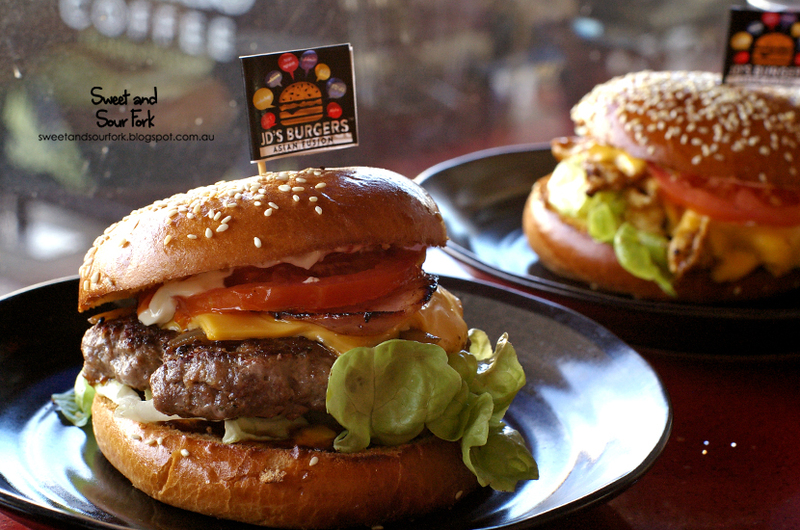 Hidden away on a suburban shopping strip in Kew is JD’s Burgers, a small take-away burger cafe that is popular with locals, tradies, and people turning in their dignity for a chance at the glory of completing the burger challenge. 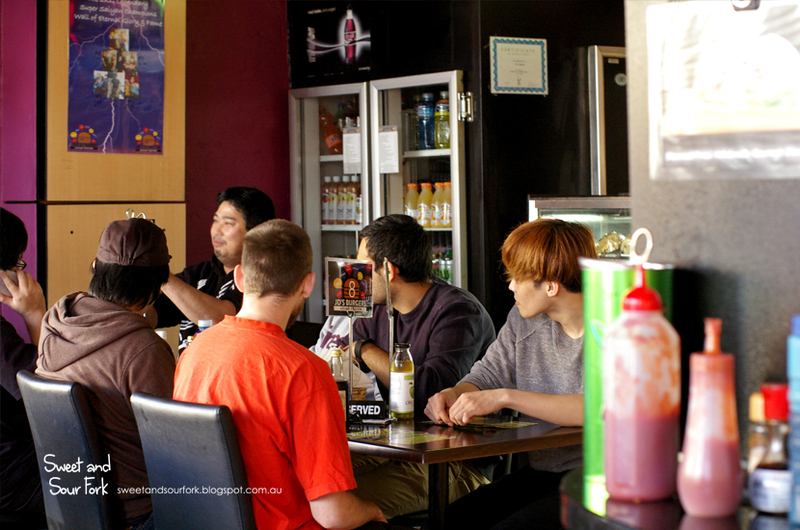 In comparison, the promise of Asian fusion burgers almost fades into the background. But I’m a little more conscious about the condition of my arteries, so instead of unhinging my jaw on the 8-layer monstrosity, I decided to check out what happens to burgers when east meets west. 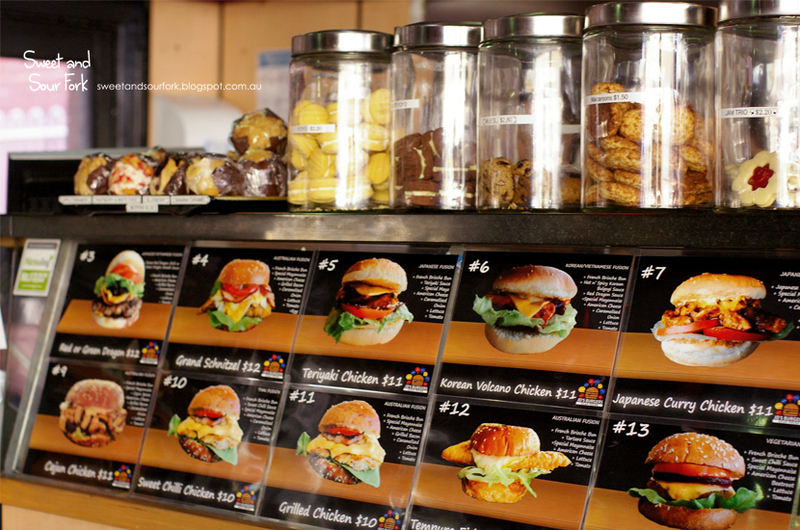 As great as fusion creations may be, what is a local burger shop if it can’t get the basics right? 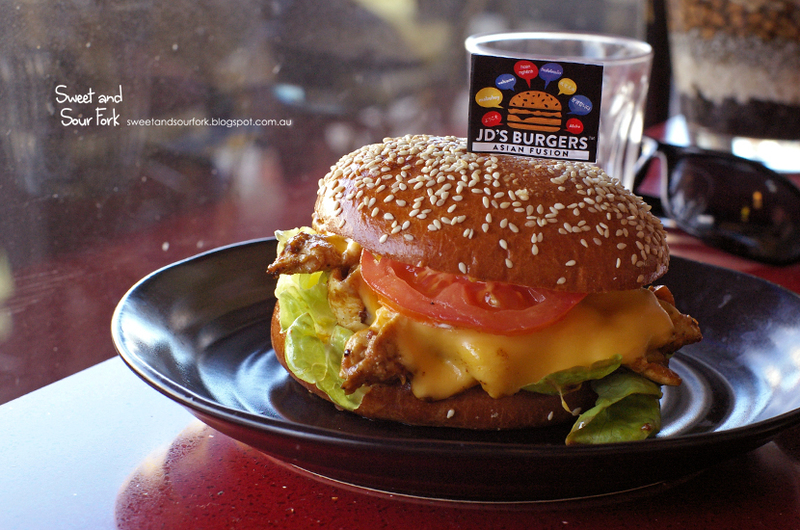 I tested JD’s mettle with their signature burger, the JD’s Mighty Beef Burger ($12). Though thick and juicy, the patty erred towards blandness, and the cheese was only semi-melted. The rasher of bacon on the other hand was intoxicatingly smoky, combining well with the glazed brioche bun. Despite its flaws, it was a satisfyingly sloppy burger that earned itself a generous pass. Of course, I couldn’t leave without trying something weird and wonderful as well. Though there are influences from all over Asia, including Korea, Vietnam, and Hong Kong, I couldn’t resist the Japanese Chicken Curry Burger ($11), which combined two things I love to eat. Between the same glossy buns was, quite literally, a scoop of saucy chicken curry, complete with chunks of potato. It was accompanied simply by fresh salad and a smear of Kewpie mayo. Even though it was unusual, it was unexpectedly delicious, even when there was nothing but sauce and bun left. I have a confession: I only went to the gym that morning so I could have an order of Beer Battered Fries ($4.5, small) without feeling guilty. They would’ve been worth it regardless, with their lightly seasoned exterior and mushy centre. 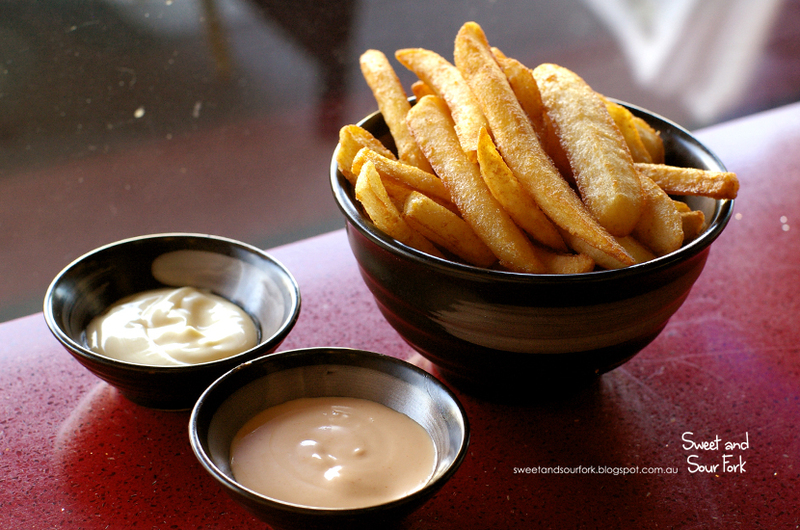 We also sampled the two dipping sauces on offer – a thick and potent Garlic Aioli ($2) which I loved, and the tangy Aurora Chip Sauce ($2) made with mayo and a secret ingredient. I thought it tasted like a faintly Asian pickle relish but alas, my tastebuds weren’t clever enough to work it out. Despite the novelty factor of the Legendary Super Saiyan Challenge, JD’s is still a legitimate place for a decent burger. They have their classics down pat, whilst offering a wacky range of fusion burgers for the adventurous. There are plenty of chicken, fish, and vegetarian options, and you can even build your own sandwich from scratch. Aside from the extremely health-conscious, there’s likely something for everybody here.